I really like this, the only problem, it's very hard to latch.....I will have to get an extender. But it is very beautiful. 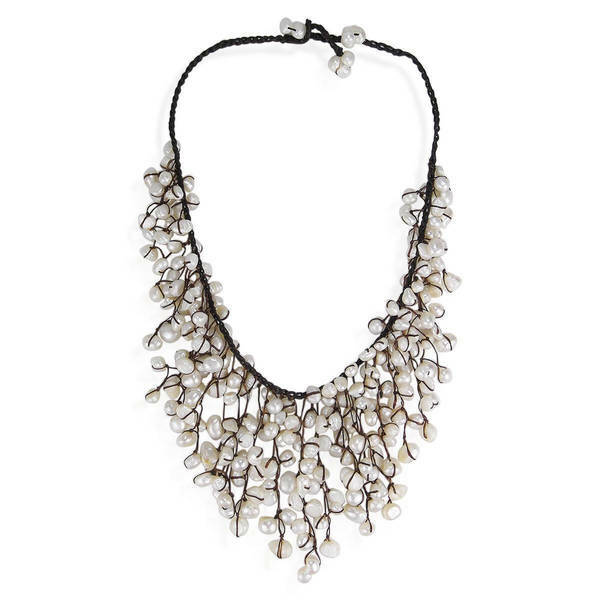 Add a brilliant splash of color to any outfit with this amazing bib necklace from Thai artisan Tor. An elegant mix of colorful beads hang from cotton wax rope, which creates a cascading waterfall effect. The added wax on the cotton rope chord helps to add durability. A truly beautiful handcrafted fashion accessory that will get noticed, this necklace will look absolutely amazing on you. (This piece comes in a variety of colors and materials to choose from). Feel free to check out more colors and designs via our other listings. NOTE: Due to the handcrafted nature of this product, minor differences in design, sizing and weight will occur from piece to piece. The exact measurements may vary slightly. Pictures may not be true to scale, please check the dimensions for the actual size. Tor was a young professional working in Bangkok, Thailand. He soon realized that his current job left him unfulfilled and he dreamed of starting his own business in something that was more rewarding. Tor describes his story in his own words My name is Tor. I have a graduate degree in finance and worked for a private firm for several years. I began making jewelry as a hobby and soon realized that it was my true calling. I saved up as much money as I could until I had built up enough capital to open my own store. With hard work and patience, I now have a few employees whom I have taught my designs and they help me fulfill customer orders. I enjoy coming up with new designs and working with my customers to make beautiful and original jewelry.